As you gain motorcycle riding experience, you will naturally begin to asses a safe following distance behind other vehicles. For a new rider however, some form of method or system may be required to gauge a safe following distance. This system is referred to as the 2 second rule. The 2 second rule can be used for car drivers and motorcycle riders. It isn’t an exact science but it does provide a fundamental platform for motorcycle riders in understanding a safe following distance. What is the Motorcycle 2 Second Rule? Understanding the multiples of thinking and braking distances that equate to stopping distances is one thing, but putting those numbers into real-time riding and visualise these distances isn’t a realistic option. The motorcycle 2 second rule offers riders a physical reference point that can be easily gauged whilst on the move. Many accidents occur each year due to vehicles following too closely. A vehicle in front brakes harshly and the following vehicle is unable to slow down or stop in time resulting in a collision. The 2 second rule, as the name suggests, allows at least 2 seconds between you and the vehicle in front. The 2 seconds safety buffer should provide the rider enough time to slow down or stop in many situations. 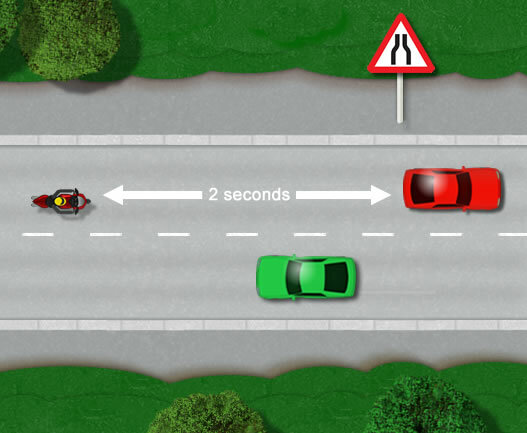 As can be seen in the diagram, the motorcycle rider following the red car has a 2 second gap. The motorcycle rider simply chooses a fixed reference point, in this example a road sign, and just as soon as the vehicle in front passes it, count 2 seconds. If you reach the reference point in under 2 seconds, then you’re riding too close to the vehicle in front. Ease off the throttle and extend your distance. Two seconds can still be applied at varied speeds as the distance traveled is increased the faster you go. Therefore, the faster you are moving, the greater the distance you have to stop in. It must be understood however that the 2 second rule is a minimum following distance based on dry, ideal conditions. In reality, situations and conditions are continuously changing. The condition of a road surface, cracks, potholes, lose debris, sand, gravel, oil and diesel spillage is reason enough to extend the following distance to over 2 seconds. The rule is also based on the rider being alert and focused on potential hazards ahead. If you become tired whilst riding for example, you must consider pulling over and taking a break. In the meantime however, increase your following distance as your reaction times are likely to be slower. Weather conditions represent a significant increase. If the roads are wet, or damp first thing in the morning, you’ll have far less grip compared to dry conditions. In this situation, you should extend the 2 seconds to a minimum of 4. If you’re out with your friends group riding, you can ride staggered, but you’ll need to ensure you apply the 2 second rule (based on weather and road conditions) to the rider following the same track, directly in front of you. 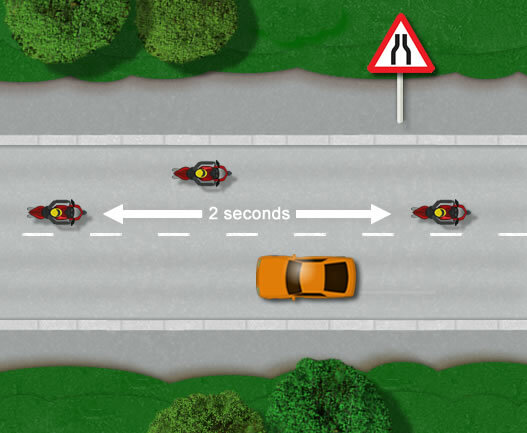 The 2 second rule provides a foundation for novice motorcycle riders to gauge a safe following distance. It’s important to understand however, that the 2 second rule is a minimum guide and that anticipation and planning ahead, recognising and effectively dealing with hazards is essential to continuously adapt a safe distance when following traffic.